Firstly you need to setup your computer to get android notification’s on computer. First of all you need to open your google chrome browser on your pc. Now you need to search Desktop notification for android on Extensions of Chrome. You can download the Extension by simply click here. Now click on desktop notification sign at the right top corner. Now sign in with google account and enter your email id and password on the login page there. You are completed your Computer work. Now you need to setup your Android phone. Firstly you need to go to google play store. Now type on search bar Desktop Notifications. Download and Install the first one. You can download the app by simply click here. Now sign it with the same Google account that you have entered in your PC. 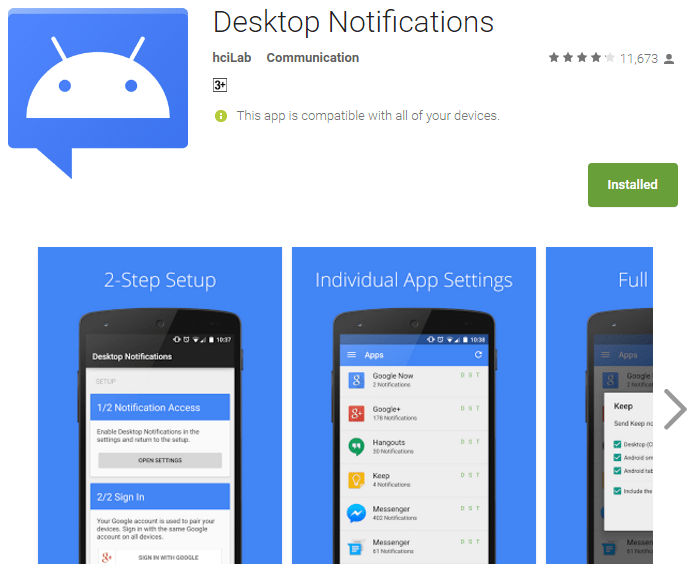 The most important step is you need to enable desktop notification of your Android guided by your app. .
Now you have successfully connected you android to your computer. Now you can get all the notifications there. Through this easy process you can now get all of your android notifications on your computer. This is the most simple process to do that. Hope you like this. Stay with us to get more.